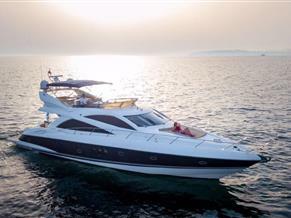 Princess Yachts Monaco is an official distributor of Princess Yachts. The company was established in 2010 with headquarters located in the heart of the yachting world – Port Hercule, Monaco. The concept of our showroom is clear – once you step inside you will feel like you are on board a yacht. Everything is made for the client. With the help of our experts, our client can easily choose a perfect yacht and every preferred option on board – all interior materials are showcased in our office. Princess Yachts Monaco is a dynamic team of professionals with profound knowledge accumulated through years of successful deals in terms of new and brokerage yachts’ sales and aftersales. The aftersales team consists of specialists who takes care of each customer throughout the whole period of yacht ownership. Our skilled team can always help with every aspect of yachting: ownership, customs registration, insurance, guarantee and post-guarantee maintenance.